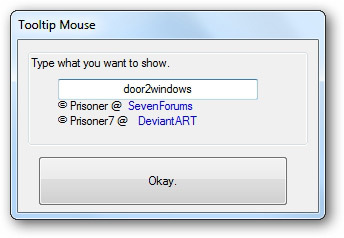 Tooltip Mouse is a free portable tool that allows you to make any text follow your cursor. Just run the tool, type what you want to show & click Okay. It will now sit in the system tray & make the text follow your cursor. If you want to change the text again, right-click on its icon and select Setup and Info. To remove the text, just right-click on its tray icon and click Exit. If it still doesn't go away, open Task Manager and end the app's process.